In a surprising twist, the victims of genocide, who vandalized statues and gravestones of their ancestor’s oppressors, may be charged with a hate crime. The incident occurred last weekend at the Spanish mission in Carmel in the wake of the pope’s canonization of Spanish missionary Junipero Serra. The statue Junipero Serra, tipped over and labeled “Father of Genocide”. Let’s look at the vandals. Their first crime, presumably, was trespassing. Let that sink in for a minute. They were trespassing at the mission in Carmel. By what historical circumstance does the mission own that land? How do they have legal title to it? It wouldn’t surprise me if the answer goes all the way back to the Spanish occupation. Point being there is probably no clear moral title to the land, and thus the charge of trespassing is morally questionable. 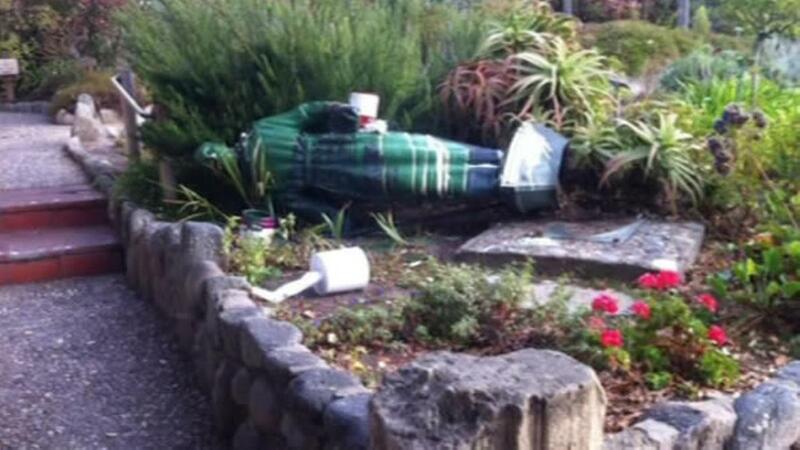 Let’s look at the crime– tipping over statues, throwing paint on gravestones. It’s a classic act of resistance by an oppressed minority, shouting in some way to be heard above the noise of their oppression, or the noise of the acceptance of their oppression by the ambient society. They are trying to make themselves heard. The white majority will no doubt advise them to act within the law– the internet is filled with white people telling brown people why they shouldn’t feel the way they do, as if the whites would be so much more mature if the roles were reversed. I’ll grant Native Americans the right to question the protesters, but whites really have little basis for passing judgement. In the California legal code, a hate crime is any interference with someone else’s civil rights, or destruction of their property, motivated in whole or part by that person’s disability, gender, nationality, race or ethnicity, religion, or sexual orientation. I suppose, then, this would be a hate crime. After all, we are talking about an action, in the vandal’s own words, in protest of genocide. The genocide clearly meets the hate crime’s definition, and thus so does this vandalism in protest of it. Both are actions defined by ethnicity. In classic non-violent theory, the vandals should not act under cover of darkness, but act in daylight and accept the consequences, which would further illustrate the perpetuation of the genocide. For that’s exactly what the canonization of Junipero Serra was, an act that celebrates and perpetuates the genocide. Selective enforcement by the authorities, ignoring the genocide or even the land title of the mission, only going after the vandals, also supports the genocide. Thus, selectively enforcing the hate crime statute only against the victims/protesters/vandals also meets the definition of a hate crime. This entry was posted in news and tagged Carmel, hate crime, Junipero, mission, Native American history, Serra. Bookmark the permalink.